Why give free school meals to pupils who are not eligible? I don’t know if a well-balanced and nutritious meal, rather than a Mars bar and chips, improves a child’s concentration, test scores or even their health. So, I cannot comment generally on the value of giving anyone a state-subsidised meal. However, if you want to use schools to improve the nutrition of children in poverty, you have to offer free school meals to those who aren’t actually currently eligible for free school meals. Why? Free school meals eligibility is currently available to a family if they are in receipt of income support, income-based job seekers allowance, child tax credits (with an income ceiling), and a few other benefits. But analysis by Hobbs and Vignoles (2009) shows that this group of children are not the same set of children with the lowest household incomes. 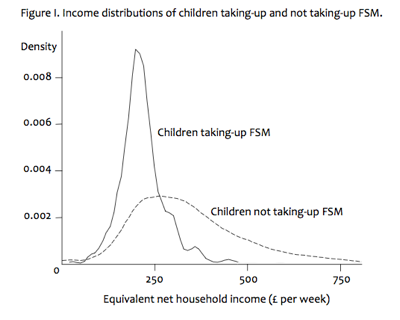 Only somewhere between a quarter and a half of the 16 percent of children who are eligible for FSM are in the bottom 16 percent of the distribution of household income, as illustrated in this Figure from their paper. How can it be that so many of our very poorest families find themselves unable to claim FSM status? Well, the very act of giving a particular set of families means-tested benefits pushes our FSM children up the income distribution, ahead of other families who are unable to claim additional income but are still very poor indeed. This is why our FSM children are only a small section of a much larger group of socio-economically disadvantaged pupils and their families. Suppose policy-makers wanted to target free school meals at poor families, regardless of whether they are in receipt of benefits or not. Can we do this effectively without giving free school meals to everyone? Well, survey data tells us that our ‘missing poor’ – the low income families who do not claim FSM – are more likely to be found in schools with FSM children and with higher levels of deprivation. So, here I try (and largely fail) to target meals at poor families by using the recorded deprivation in their school. I define being ‘poor’ as having less than 60% of median wage of other households with children (just under 18% in my dataset). I am using the Longitudinal Survey of Young People in England to illustrate this, which isn’t perfect because the children are in secondary school rather than primary school, but I don’t have quick access to alternatives such as the Millennium Cohort Study. The data crunching is quick and dirty, but I think it is enough to illustrate the point. Our aim is to devise a rule for giving meals to children that successfully targets as high a proportion of our poor families as possible, while minimising the size of the overall transfer (this is our burden on taxpayers). So, for example, the current rule in use only gives meals to FSM eligible pupils. The overall size of the transfer is relatively small – 16% of all pupils – but only 47% of our poor children are successfully targeted. Indeed, almost half the transfer goes to children who are not actually in poverty according to our measure. The first alternative rule I try is to give free meals to all the FSM pupils, plus all pupils in schools where over 30% of the cohort are FSM eligible, regardless of whether they themselves claim benefits. This clearly becomes a more expensive policy because 23% of pupils now get a free meal, but we do successfully reach more poor children (55%). However, the ‘leakage’ out to the non-poor that we do not want to target rises to 57%. If we lower the school-based criteria so that all schools with over 20% FSM rate get free meals then we can successfully reach 64% of poor pupils, but two-thirds of our subsidy now goes to families who are not poor. This targeting of poor families is not very successful and I cannot do better using alternative school-based deprivation measures (such as the mean IDACI of pupils at the school). It appears that devising a policy that uses published school deprivation statistics to try to locate poor families is pretty impossible. If you want to give free meals to families in poverty without collecting further household income data, it seems impossible to avoid making large transfers to families who are not in poverty. You could ask parents to apply and prove their income, but this might discourage uptake and is administratively costly. The alternative route to achieving blanket coverage of families in poverty is simply to give free meals to all schools, as the pilot schemes in Durham and Newham do. I’m not arguing that this is a good or bad use of tax receipts, but the above analysis does explain why the former Labour government decided that there are few obvious alternatives to universality as a route to giving food to children in poverty. Hobbs, G. and Vignoles, A. (2009) Is children’s free school meal ‘eligibility’ a good proxy for family income? British Educational Research Journal, (forthcoming – the journal, like so many in the social sciences, has a chronically long lag between submission and publication, but you can freely read an early draft of the paper here: http://tiny.cc/42e5d). I always was of the opinion that every school operated a free school dinners policy and judging by my own school days there were very few families who actually paid for meals. Depending on the area you live the actual implementation of blanket covering every where with free school meals maybe very beneficial indeed.